A snippet from a regular column in The Egyptian Gazette by journalist Hugh Nicol, titled “Red-Handed”, which salubriously details local crimes, very often featuring rather horrific crimes of passion. See below. “A 23-year old woman called Samar Attiya got her revenge on the lover who refused to marry her by pouring acid on a sensitive part of his body in the early hours of the morning. The young man died of his injuries in hospital. The deceased 25-year-old Ahmed Moustafa, an accountant from Maadi, was due to get engaged [to another woman] the following day…Two of Ahmed’s friends told police that he’d been intimate with a young woman called Samar, whom he refused to marry. She then asked him to pay for a hymen reconstruction operation, in order to prevent scandal. When he didn’t cooperate, she got in touch with the woman who he was planning to marry and started threatening her. Samar, a 23-year-old nurse from Shubra el-Kheima…admitted killing Ahmed, explaining that she slept with him because he’d promised to marry her. On the night he died, Samar rang Ahmed and told him she wanted to make love with him just one more time before he got engaged to the other woman. 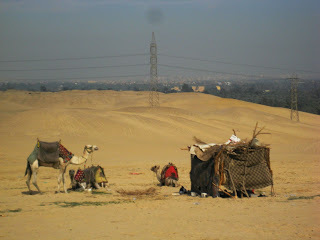 He met her in the early hours of the morning on the Cairo-Helwan Agricultural Road. Chopper. Hmmm. Other notable stories this week include a teacher from Alexandria charged with beating a tardy student with a stick, breaking two ribs. Notable because last year, another Alex teacher was convicted of beating a student to death. And the lead story: The Egyptian transport minister has resigned over the rail crash that killed 18 people earlier this week. The crash took place when one train stopped as there was a water buffalo on the track, and a second train rear-ended the first. Three railway workers, who were supposed to be watching the track, have been charged with manslaughter. One survivor reminisced about an injured woman “screaming for her new shoe and asking other wounded passengers to help her find it”. The daily cartoon is particularly bleak: a man buying a train ticket from the station window is asked for his destination, to which he replies, “The hereafter”. Thanks to everyone who thoughtfully emailed to make sure I wasn’t on the train. Hi all, Egypt’s going great guns in the Australian press at the moment. This piece appeared this week in Sydney’s Sun Herald newspaper. Much is drawn from blogs, so don’t yell if you think you’ve read some of it before! If you were asked how you’d like to spend a year of your 20s when you’re fit, strong and virile, you probably wouldn’t choose a drowned Nubian desert with no women, no shops, late-night cafes and definitely no all-night rave clubs. Unfortunately for the young Egyptian guy standing in front of me, that’s exactly the hand he’s been dealt. 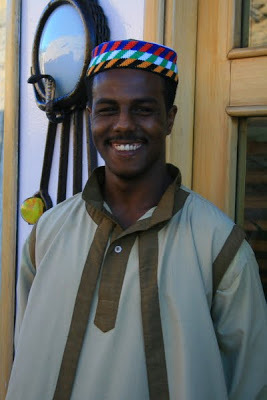 He’s stuck here in southern Egypt, serving his compulsory military service in a grubby might-have-been-white uniform as part of the police presence at the historical temple complex of Wadi el-Seboua. We get excited spotting him as he’s one of the few people we see from our cruiser, the MS Kasr Ibrim, as we coast from Aswan to Abu Simbel on the silent waters of Lake Nasser, just north of the Sudanese border. “No photos, no photos!” he shouts as we attempt to snap the first living thing we’ve seen all day. But every time he senses a camera, he avoids eye contact and assumes a suspiciously practised pose, gazing out to the water, gun at the ready. These temple sites are serious one-donkey affairs and accessible only by boat. “In 2009, the lake is considered isolated but in 1300BC, when the Pharaoh Ramses II built these temples, this would have been considered the end of the Earth,” our guide, Safi, says, waggling a long finger. For the policeman, it still is. Aside from travellers in a few luxury cruisers, the only people the young copper sees are the temple guards from the Egyptian Department of Antiquities and some fishermen who double as camel-tour touts. There’s just the temple and the lake. For him it’s hell but for us spoilt few, it’s two flights downstairs from heaven. Lake Nasser is the world’s largest artificial lake and is often described as one of the great engineering feats, a statement that, unless you’re an engineer, just makes you want to nod off. It’s not until you’re on the lake – and concurrently in the midst of the desert – that it sinks in. Lake Nasser is more than 500 kilometres long and up to 30 kilometres wide. 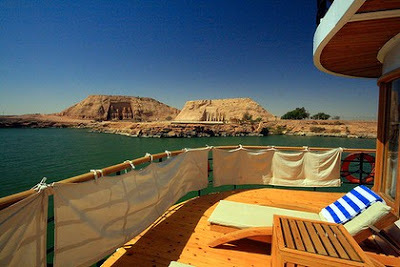 Unlike the Lower Nile cruises between Aswan and Luxor, you can barely see the coastline. And what you can see is desert, sans oases. No lush palms, little villages or happy farming scenes. Occasionally, we spot a tiny shack for fishermen chasing balti and the monstrous Nile perch that can grow to more than 180 centimetres long and tip the scales past 170 kilograms. Of the handful of cruisers operating on Lake Nasser, our boat, a 1920s art deco extravaganza named after a ruined Nubian fortress, is the best known. Instead of a single cabin with a porthole the size of a pigeon’s eye, I’ve landed a suite with a wraparound sundeck and walls of walnut veneer. There are a few old-fashioned touches, like the built-in radio near the bedhead and the paper hygiene strip wrapped around the toilet a la the Miss Congeniality sash on a beauty queen. The Kasr Ibrim is usually 60:40 French to Brits, though this time the French have well and truly won and there are but nine native English speakers on board. We’re a small, energetic group, me and the Brits in their 50s and 60s, and are raring to go with Safi, our own hip, lanky guide. While still moored in Aswan, we take a little boat out to the Temple of Kalabsha, set on a sometimes-island in the lake. We take in the nitty-gritty of the carvings – sure there’s Horus, Isis and all the ancient godly gang but also reliefs of macho Ramses II giving some Nubian soldiers a good hiding, receiving an exotic procession of people bearing leopard skins, shields, fox furs, monkeys, cheetahs and giraffes and, as a full-grown man, being breastfed by goddesses; cue for naughty snickering and talk of Oedipal complexes. The next morning we set sail, navigating the original channel of the River Nile. Looking over the pilot’s shoulder, I see dark spots on the radar, a drowned landscape submerged in up to 180 metres of water. We clink glasses as we cross the Tropic of Cancer and stop to explore the temples of Dakka, Amada, Derr and the ancient tomb of Penout, where a bloke wearing a dusty jellabiya waggles a baby crocodile at me. “Five pounds for a photo,” he mutters as I pass. It might be just a few weeks old but already the Nile crocodile has the 1000-yard stare of a born killer. They’re famously bad-tempered and famously shy of humans (despite having a taste for us) and we spot a grown-up croc languishing on a muddy riverbank giving a few flamingos the eye before sliding into the waters. In their heyday, the temples along the lake’s shores were part of the lands of Nubia, one of those ephemeral concepts of a country where a distinct ethnic group’s traditional lands have been swallowed by surrounding countries or, in this case, a lake. Poor Nubians – they’ve been beaten by both ends of the stick. Their heritage was first lost to the shifting desert sands, then rediscovered in the early 1800s when a Swiss explorer stumbled upon Abu Simbel, only to be lost once again, along with their villages, to the rising waters of the dammed Nile in the 1970s. It gives a whole new meaning to being between a rock and a hard place. The government relocated the 800,000-odd villagers, paying them a small compensation, and when the global village realised the proposed Aswan High Dam, built between 1958 and 1971, would also immerse a swag of significant temples, 54 countries rushed in to perform heroic piece-by-piece removals and reconstructions, including the piece de resistance, the relocation of Abu Simbel. After three days’ easy sailing, we arrive at Abu Simbel, the jewel of Nubia, bang on lunchtime. Our cruiser prowls the waters in front of the temples for a rare view of the 13th-century BC temple, with the megalomaniacal tribute to Ramses II – four 20-metre colossi demanding the attention of our cameras. Forget schlepping through the temple in the heat of the day with the hundreds of tourists who’ve flown down or travelled from Aswan in a convoy of buses, though; later, once the weather cools and the other tourists have gone home, we’ll disembark to explore the temples in relative peace. But for now, we will take lunch with kings and gods. During the relocation, the temple was sliced into 830 blocks and moved up and away from the lake. Only the faces remained uncut. The temple was even reconstructed so the sun still falls on Ramses’s face twice a year, on his birthday and his ascension to the throne, as per the original design. Essentially, Abu Simbel was an enormous public-relations exercise – those entering the kingdom from the south via the Nile would be reminded of the greatness of that land’s ruler by being confronted by massive statues of Ramses. Word has it he was a bit of a cuckoo, stealing earlier kings’ victories by slapping his cartouche everywhere, talking himself up as ruler of the world. Seems he was more a lover than a fighter, fathering almost 100 children. Officially, you can’t take photos inside the temple but for an idea of scale, thousands of tourists are snapped beside Ramses’s seated statues at the front of the temple. Little ants, we barely reach the top of his great toes. We stay at the temples until dusk, then take a seat at his feet for the sound and light show. “Son of the sun, king of eternal time,” begins the stentorian voice of the storyteller in the darkness. 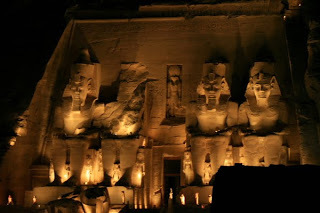 Clouds of light race across the night sky to grow stronger until they illuminate the temples of Abu Simbel. Lover, fighter, builder, glory hound: Ramses II is showing nightly, proof that fame is the elixir of eternal youth. Etihad Airways flies from Sydney and Melbourne to Cairo via Abu Dhabi. Phone 1800 998 995, see etihadairways.com. EgyptAir flies Cairo-Aswan-Abu Simbel. It’s not quite The King and I – but here’s me and the Duke of York, Prince Andrew, at Alamein’s Commonwealth War Cemetery on Saturday, which was the day the UK remembered its war dead in the World War II battles that took place here. Ok, I wouldn’t say he’s standing BESIDE me, but you get the picture. I was there with a Californian press photographer, who sidled up to me, muttering “Which one is he?” The answer: the one in the bright red hat. Dead giveaway. Most non-Commonwealth people thought the rather dashing silver-haired gent beside him was the prince (we think that was one of the ambassadors who attended). 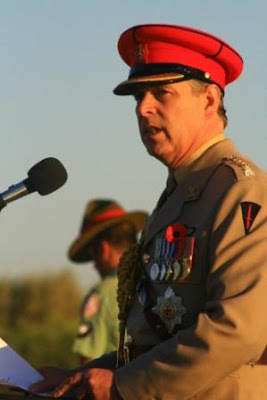 The Duke of York, HRH Prince Andrew, today signaled the UK’s resolve to continue its involvement in Afghanistan. Speaking today at the 67th commemoration of the defining WWII battle of El Alamein on Egypt’s Mediterranean, HRH the Duke of York said the youth of the soldiers whose names are engraved on the cemetery’s tombstones is a reminder of those British troops currently serving in Afghanistan. 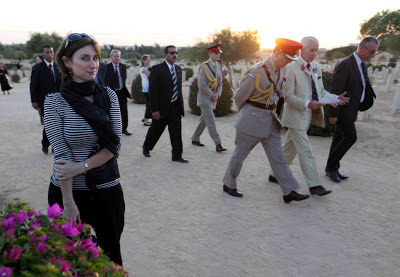 The speech was held at the Commonwealth War Cemetery at El Alamein, which has more than 7000 tombstones commemorating the lives of British, Australian and New Zealand soldiers as well as other Allied nationalities. There are also German, Italian and Libyan war memorials in the area, where more than 80,000 soldiers died on the Western Desert front, including the 13-day attack from 23 October 1942, which saw one in six Allied and one in three Axis troops killed in action. In a separate event 20km along the coast, organisers of an Egyptian group aimed at removing landmines from Egypt’s north coast say the region still has around 16.7 million unexploded devices dating from WWII, including shells and mortars, aircraft-dropped bombs, rounds of machine guns and small weapons, as well as anti-vehicle and anti-tank mines. The UN-sponsored de-mining group says the civilian casualties and deaths as a result of these mines numbers ‘in the thousands,’ and estimates it will cost US$250 million to clear the remaining unexploded devices from the region. It is currently lobbying for assistance from the countries who laid the bombs to clean up the region. Just to prove I’m not moaning on Facebook about nothing, here’s the lead story for this week’s English version of Al-Ahram newspaper. ‘For once, as it turns out, the burning of rice chaff by Nile Delta farmers is not responsible for the seasonal air pollution known as the black-cloud phenomenon, writes Mahmoud Bakr. Or so the Ministry of State for Environmental Affairs assures us. Air pollution this week is the result of a dust storm that started in Chad and blew over North Africa, according to Ahmed Abul-Soud, head of the Air Quality Department at the ministry, taking a northeasterly direction and covering a large expanse of southern and northern Egypt on Saturday evening and the next day. For their part farmers have not however stopped burning their chaff, despite more severe fines and other efforts on the part of the ministry. Maged George, the minister of state for environmental affairs, warned of air pollution in the next few weeks due precisely to the burning of rice chaff, elaborating on the ministry’s plan to encourage recycling on a large scale. All quiet…until tomorrow, when I visit the former North African front of World War II, the village of El Alamein on Egypt’s Mediterranean coast,130km west of Alexandria. Here was fought what Winston Churchill described as one of the defining battles of that war, on 22 – 26 October 1942. 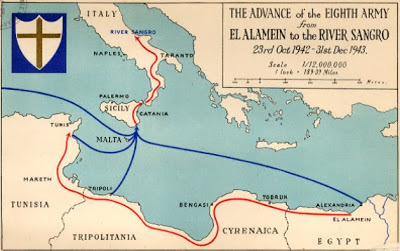 It is estimated 80,000 soldiers have died in the area from 1940 to 1942, with the 1000km-long battlefield of the Western Desert stretching from Alexandria into Libya, control of the Suez Canal the plum reward. Just out of interest for Aussie readers, there are 22,000 graves in the cemeteries at Turkey’s war site, Gallipoli, also on Mediterranean shores, of which 9,000 are of identified burials with grave marker. Each year, there is a commemoration service held at the El Alamein site run by one of the three countries who have substantial war cemeteries there: Britain (with 7,240 Commonwealth headstones), Germany and Italy. This year, it’s Britain’s turn, and Prince Andrew is expected to turn up. If you’re interested in following it further, the Commonwealth War Graves Commission has a very good online search engine, its Debt of Honour register, where you can search by surname, nationality, year of death. 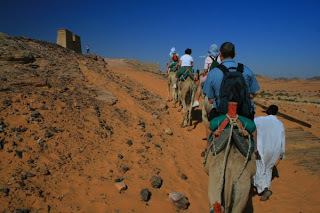 Pink, Princess and Apple (To’faa): it sounds like picnic of Barbie dolls rather than three horses heading out for the 35km round trek between Giza and Sakkara pyramids – from one of the world’s most touristy sites to its lesser known cousin. 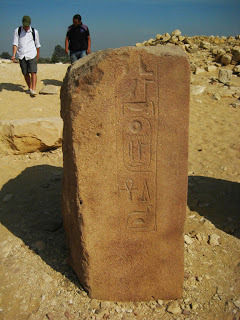 In fact, dating from 2650BC, Sakkara is the world’s oldest stone monument. The horses were snippety and cross while being saddled, fidgeting when we mounted, To’faa tried to bite Princess, who in turn had her hoof ready to give someone, anyone, a kick. Pink just twitched a lot blinking her long lashes, which were black on one eye and white on the other, lending her a curiously random look – like you don’t know what she’ll do next. All very Clockwork Orange. We headed off at 6.30am, when the massive ball of red sun was still rising at Cairo was still warming up to its frantic pace. Unfortunately, the route’s not all scenic. We had to cross a rock quarry with its busy trucks, cross and recross beneath massive electricity towers and pick our way through a mountain of rubbish in between stretches of empty desert. I left Pink her head to find the best route, and she took advantage of my lack of direction, interpreting it as I didn’t care if she walked the whole route. The city of Giza, which sits alongside the city of Cairo, ends abruptly at the desert where the Pyramids begin. When you fly over it, it’s like someone’s drawn a line and said: sand here, palmtrees there. So our route skirted the edge of the greenery at times, or climbed into the barren desert, marked only by ancient ruins and electricity poles. We stopped for tea in the Sakkara Country Club, watching enviously as a British woman on a mobile phone passed, iPod strapped to her bicep and clad in tight brown jodhpurs. She was astride a spectacular strutting bay gelding. Every inch of the pair gleamed and they really had a connection. “Pink, you could look like that,” I told her, to bolster her spirits. Pink looked at me like I was crazy. There are said to be around 90 pyramids around Egypt, including the 20-odd pyramids here in Giza, Sakkara, which has 11 major pyramids alone. There is one collection of step pyramids that isn’t hemmed in by fences, the pyramids of Abu Sir, according to a man in a gellibaya who it seems was sleeping on a wooden platform in the desert, morphing out of nowhere to chat and hold our horses. I pushed Pink up the hill onto the first of the sites and, while I admired the architecture, I’m embarassed to admit that she crapped on its ancient stones. The four crumbling pyramids of Abu Sir are between Giza and Sakkara, and date from 2494-2345BC, in the fifth dynasty, when Memphis was the capital of Egypt. My guidebook tells me the city was chosen as the symbolical point where the Nile Delta met the valley, unifying Upper and Lower Egypt. From our vantage point up on the desert plateau above, you could never tell Memphis was such a grand city – donkeys towing massive loads compete for road space with enormous lorries, minibuses packed to the gills and the canal that runs down here is clogged with mountains of garbage, which doesn’t seem to deter keen fishermen and intrepid boys seeking respite from the summer heat. 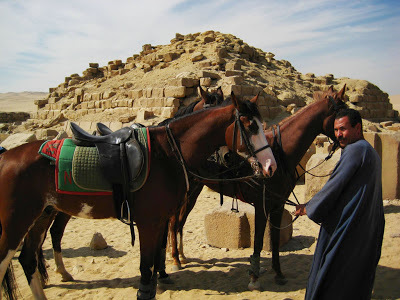 We had a little photo shoot on our pyramid – it would take a return visit with guidebook in hand to work out where we were – and admired the three peaks of the Sakkara pyramids on the next hill, and turned our horses home. We met a couple of old men watering four camels by a small stream, then saw later they had set up camp in the desert and were brewing tea. True Bedouins. Pink was eager to get home so we galloped in our last breath of freedom. Our horses were taken by little boys who really should have been in school and I watched them hose Pink down: they put a finger over the nozzle to make the spray hard, and she stuck her face in the hose, letting it blast down the long white blaze on her nose. The ride out to the Country Club took about two hours each way, and the ache kicked in even as we were driving home. Would I do it again? Tomorrow. 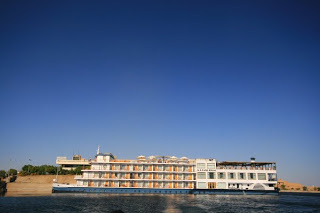 Hi all, here’s a story I had published in Australia’s Sun Herald newspaper recently about cruising the Nile in Cairo. Enjoy! Exploring the Nile in downtown Cairo comes with volume control. 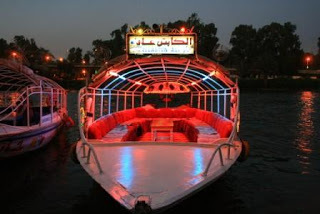 WHAT Cheap Nile cruises in Cairo. 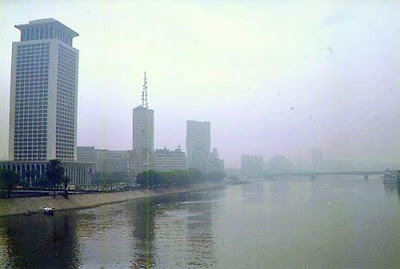 WHERE The Nile River, runs through downtown Cairo. HOW MUCH From 4 Egyptian pounds (about $1) for a 20-minute spin or 50 pounds for an hour in style. WHY GO Feluccas have been trawling the Nile for millennia. 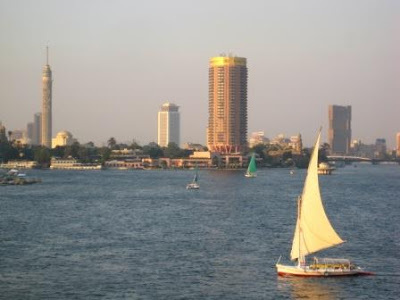 In Cairo, there are two main types – the long, low, motorised boats and the more elegant sailboats. Motorised feluccas operate mostly from sunset into the night. They can accommodate up to 20 people for a quick-and-dirty 20-minute spin up the Nile for less than a dollar and depart when the boat is full. You can’t miss these boats; they’re the little floating discos with pink, fluoro lights and loud music. This is definitely a local scene: the outboard motor is whiffy, the PA plays tinny Arab pop cranked up to 10 and unless you hire the entire boat for yourself, you’ll find yourself squished up against plenty of happy Egyptian tourists. In short, it’s Cairo in a microcosm: loud, smoky and up for a laugh. You’ll skim past ramshackle houseboats, riverside clubs and the big, evocatively named dinner-cruise ships moored alongside the riverbank – Omar El Khayam, Nile City, Le Pacha 1901. Departure points for motorised feluccas include the promenade near Qasr el-Nil bridge in the suburb of Gezira. Option two, on a sailboat felucca, is infinitely more relaxing – a quiet hour spent cruising the Nile will set you back about 50 pounds, with the price including the entire boat, which can hold up to 20 people and the captain. The best time is to head out before sunset, armed with a few beers or a bottle of wine. They sail between University (Al-Gamma) Bridge and Galaa Bridge, near Doqqi. 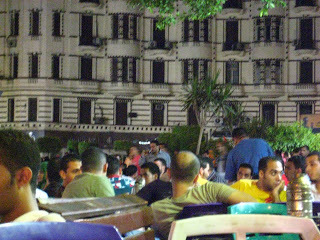 The best launching spot is Dok Dok on the Corniche el-Nil, opposite the Grand Hyatt or Four Seasons Nile Plaza. You’ll spot Dok Dok himself – at 89 years old, the grand doyen of feluccas – taking tea with his many sons on the pier. A taxi will cost you just a few pounds from downtown, but make sure they don’t take you to the Four Seasons Giza. FREE STUFF On the motorised boats, free entertainment comes in the form of a crackling tape player but if you’re lucky, the captain’s children might get up and do a surprisingly good belly dance or the traditional boys’ dance. No, you won’t see the pyramids but you will see 187-metre Cairo Tower, a phallic column built in 1961 allegedly with US money sent as a bribe to win Egypt over during the Cold War. As night falls, the sparkling tower changes from pink to puce to aquamarine. You can also see the Cairo Opera House. Forget swimming: the current is ferocious and you could get bilharzia. ADDED BONUS The sailboats are much slower and steadier than their motorised mates, so you can photograph the Opera House and Cairo Tower. Leave half an hour before dusk for some great skyline shots of Africa’s most populous city. 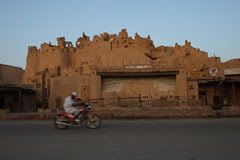 Legend goes the mosque in Shali town, in the Siwa oasis, was the last to use a live adaan. Now, they’re all voice recordings that vary with every mosque. Sometimes, I love it. I love it when I’m up working late and I hear the fajrthe call at morning light. Cairo is so still, you can hear the mosques starting up within seconds of each other, the call rolling like waves across the sleeping city. In my street in Roxy, I look out to see a few old men, past the age of sleeping, who walk silently to the mosque, and gather to talk in the street afterwards, white gellibayas fluttering with a little breeze, prayer beads in knotted hands. Sometimes hearing the fajr fills me with despair – it means I stayed up too late again and I’ll pay later, when I’m yawning all day. The blog is quiet: I’m stuck inside working all week. 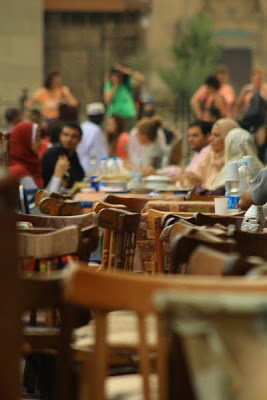 Really, I could be anywhere, not in the raucous hype that is Cairo. The only difference is the phone is Skype and sending photo disks takes a week longer than if I was in Aus (Egypt Post fluctuates between unbelievably speedy and slower than a recalcitrant donkey). Yesterday was a day the entire city caught up on its sleep thanks to a public holiday. 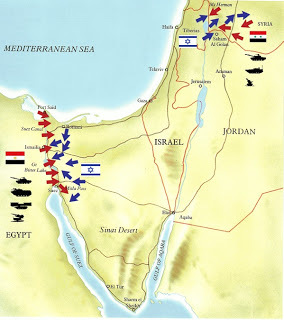 It was 6 October, and the 36th anniversary the day Egypt took back the Sinai peninsula from the Israelis. The TV was full of interviews with veterans, some even in tears as they recounted the horrors and glories (but mostly glories) of war. 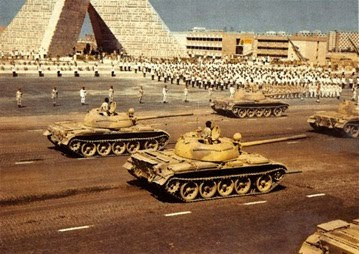 Then the TV commentators gave a blow-by-blow description of Egypt’s glorious day in 1973: from 2pm – the time the Egyptians started to attack the Barlif Line, a massive sand wall the Israelis had constructed on their side of the Suez Canal – until 8pm, when the Egyptians had taken the 8km by 20m high wall through a range of cunning engineering tactics and strafe bombing. Egypt is good at creating and then celebrating heroes (you only have to look at football to know that). 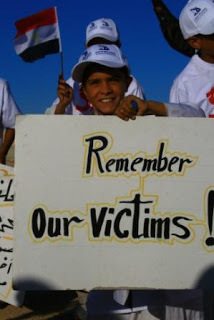 And war is no different: the heroes of the war include the younger brother of the then president, Sadat, who was the first casualty, the man who raised the first Egyptian flag on Sinai soil, and the head of the communications department that coordinated the successful attacks by 222 planes and its foot soldiers on the Israelis. The old documentary reels shows Egyptian soldiers in bunkers with lots of black Bakelite telephones and a sophisticated tracking system, though the one thing missing is the inevitable cloud of cigarette smoke (this being the 60s, a stressful time and…Egypt). If they hadn’t crossed the Suez Canal and won the war, Egypt wouldn’t control the Suez Canal (its largest single source of foreign income), the Sinai would be Israeli and that contentious Egypt-Israel border would be just 130km from Cairo. When we have war remembrance days in Australia these days, it’s all talk about loss of lives and learning from our mistakes – ironically, our war anniversaries are a time for peace. But of course, apart from the mess of the Vietnam War, which our government is still confused about how it should feel about it, our last big war (and remember, we were on the winning side) was World War II in the 1940s – time has mostly healed this wound. For Egypt, the anniversary of this great military victory is a time for patriotism and retasting the victory after years of humiliation at the hands of its neighbours. The taste of revenge is still sweet.